Hand-finished wooden frame with chalkboard painted talk bubble Display a photo and add a person..
Pearhead is proud to bring you its uniquely designed signature collection made with the highest qual..
Store all or your cherished family memories with the Pearhead Side Photo Album. 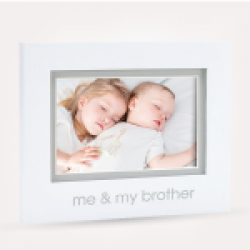 With easy to load sl..
Pearhead's i love grandpa photo frame is a sweet and simple way for your little ones to express th.. There's no feeling like seeing your bundle of joy for the first time. Pearhead’s sonogram frame is t..
There’s no bond quite like the bond between siblings. Celebrate that special bond with Pearhead’s ..
There’s no bond quite like the bond between a baby and their Grandma. Celebrate that special bond wi..
There’s no bond quite like the bond between siblings. Celebrate that special bond with Pearhead’s se..
There’s no bond quite like the bond between a baby and their Grandpa. Celebrate that special bond ..
Hand-finished wooden frame Showcase from belly to baby Acid-free beveled mat Hand-finishe..
There’s no bond quite like the bond between a baby and their dad. Celebrate that special bond with P..
There’s no bond quite like the bond between a baby and their mom. Celebrate that special bond with P..
Mommy + daddy = me adds up to total cuteness. Our family frame is an adorable way to showcase the ne..
Add these floral letters with wooden frames to your living space. Each one is handmade with love :)&..
calligraphy framed canvases *Non-Profit* ..
1. A gift idea for a range of celebrations including Christmas, christenings, baby showers and birth..